If you’ve never looked into this before, a ligature is a combination of letters that are designed as a new distinct glyph. In this case, there’s an “fi” shape that is used when you have an “f” and an “i” next to each other. 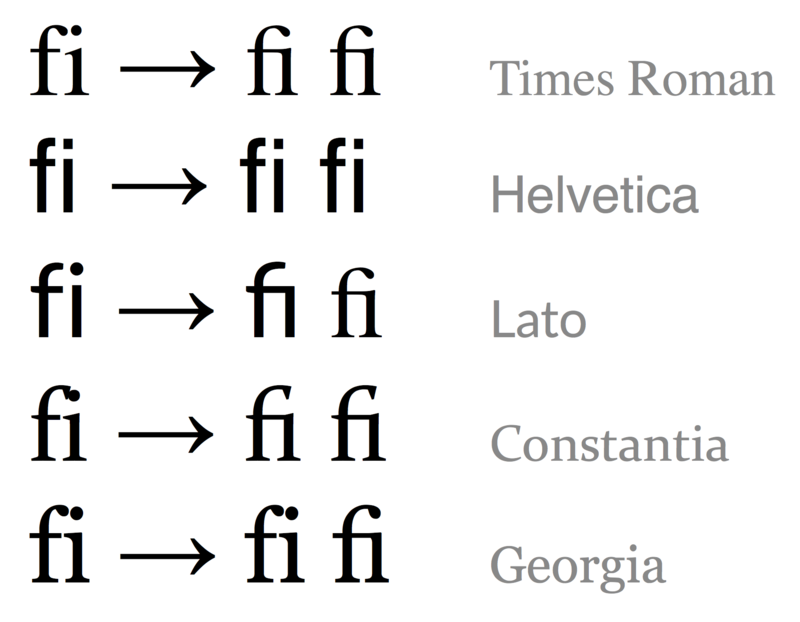 Ligatures have a long tradition in Latin fonts, for a reason: some pairings of letters can have a jarring look. The bulb of the f and the dot of the i can clash, and it looks better to design a combined shape that shares the space better. But Lato doesn’t suffer from this problem. Ligatures are a solution to a problem, and here they are being used when there is no problem to solve. The Lato fi ligature is more jarring than the f and the i, because it looks like there’s no dot for the i. The naive Lato f and i look fine together without any intervention. The ligature looks silly without the dot. The f is trying to reach over to join the dot, but it’s too far to reach, so it doesn’t get there, and the f has no bulb in the first place. It doesn’t make any sense. Constantia and Georgia demonstrate a good use of ligatures: the naive pairing shows how the bulb and the dot crowd into each other, and the ligatures shift things a little to resolve the clash. (Somehow, Lato doesn’t map its fi ligature to the U+FB01 code point, so we get the default font there instead.) If you want to experiment, here’s the HTML file I used to make the image. Futura also has a very strange fi ligature. and you could add it to the Stylebot chrome extension for readthedocs.org. I actually have a global rule to add ligatures for all sites but I agree the the Lato one isn't nice. @chris, thanks! Now if I could only get those styles applied in the Slack native client. It's really just a wrapper around the web code, but there's no way in.